Today, we’re enhancing our APIs, making it easier than ever for the developer community to integrate with Android Pay. With just a few lines of code, you can enable quick and seamless checkout to help increase purchase conversions and ongoing engagement. Earlier today, we announced Android Instant Apps, which gives users the ability to pay using Android Pay with a single tap, without the friction of getting a user to install the app to complete their transaction. We’ve teamed up with payment processors globally so developers can integrate Android Pay with their Android apps in just a few hours. Many users continue to make purchases on mobile sites. But buying something from a website on your phone can be clumsy and cumbersome, which results in much lower conversion rates on mobile sites than on desktop sites. To make painful web checkout forms a thing of the past, we will be launching PaymentRequest, a brand new web API that we are developing together with Chrome and standardizing across browsers through W3C. Android Pay will be part of this API to allow users to pay on mobile websites as they do in-store and in-app. Enable users to add offers, loyalty cards and gift cards in the Android Pay app with the tap of a button. Simply add a deep link to an email, SMS message, push notification or within an app and you’re all set. Enroll new customers into a loyalty program in a variety of ways with the new simplified sign-up feature. Customers can sign-up either in store via a NFC tap or through a sign-up page linked from an Android Pay transaction notification. We believe that mobile payments can make for a better, more secure shopping experience - so we're in this together for the long haul. We’re building a robust Android Pay ecosystem, one that’s open and scalable, to enable developers to drive mobile payments - and their businesses - forward. We're very excited for the road ahead and we hope you are too. 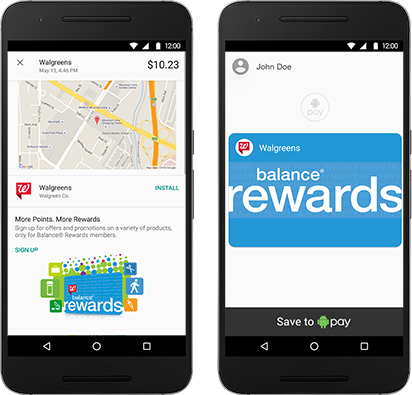 To learn more about Android Pay and share your feedback, visit our developer pages.